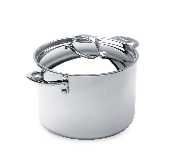 Cuisinox Deluxe® 11 qt Covered Stock Pot receives high scores for performance and value. Meticulously designed and made of high quality 18/10 stainless steel and tempered glass lids. 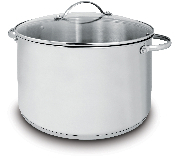 The Cuisinox Elite® 8.2 qt Covered Stock Pot has a high luster mirror finish combined with the arched top lid giving this Stock pot it’s unique look and style. Stainless steel rivets permanently attach our cast stainless steel handles. Cuisinox Elite® 11 qt Covered Stock Pot's high luster mirror finish combined with the arched top lid gives this Stock pot it’s unique look and style. Stainless steel rivets permanently attach our cast stainless steel handles. Cuisinox Elite® 14.2 qt Covered Stock Pot with a high luster mirror finish combined with the arched top lid gives this Stock pot it’s unique look and style. Stainless steel rivets permanently attach our cast stainless steel handles. Cuisinox Gourmet® 11 qt Covered Stock Pot shows when practicality meets elegance, the result is this useful beautiful stock pot. Just a charm to use and its durability guarantees satisfaction. Cuisinox Gourmet® 17.2 qt Covered Stock Pot shows when practicality meets elegance, the result is this useful beautiful stock pot. Just a charm to use and its durability guarantees satisfaction.